As a member of the acute-pain team, I have been involved with a number of cases where patients have been ordered inadequate amounts of analgesia by the primary treating team. Often, these patients were already taking opioids at home and on admission these baseline medications were either not re-ordered, or they were switched to another opioid inappropriately. ‘Analgesic’ is a simple app by Skierkowski LLC that could potentially avert some of these issues. Although this app is specifically targeted to anesthesiologists, it could certainly be useful to any physician prescribing opioids. The app and its interface are extremely basic. 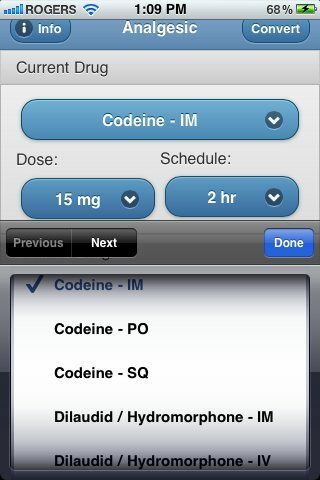 In the opening screen there is a drop-down menu to select the patient’s current medication. Conveniently, each drug has multiple routes listed. 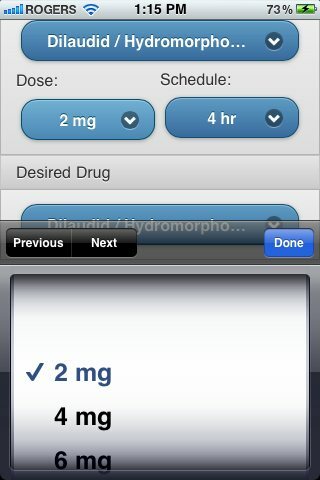 Following drug selection the user can select the dose and frequency (listed as “Schedule” in the app). Finally, the drug desired can be selected. 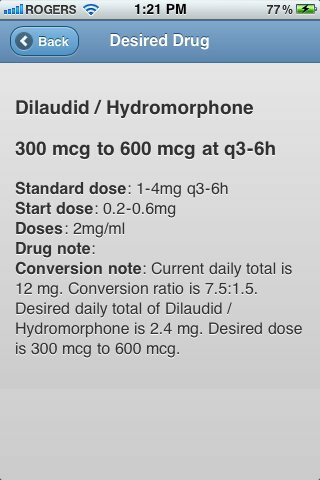 In the example shown below I have done a simple conversion between dilaudid 2 mg PO q4h to dilaudid iv. The recommended dose is within the range that I would calculate myself. I was, however, disappointed with the explanation provided for the calculation. First, it is unclear what reference has been used for the conversion values (these values can vary depending on source and context). Second, a valuable opportunity to educate the user on the principles of opioid conversion is lost. In the above example a simple conversion factor is provided; however, in more complex conversion between drugs no explanation of the multiple steps required is provided. Third, basic principles of pain management are not reinforced. There could be a reminder to put the patient on “foundational” analgesics (i.e an NSAID and acetaminophen as per the WHO pain ladder). Perhaps most troubling (and potentially dangerous) are the conversions provided for methadone. At higher doses of “morphine equivalents” the dose of methadone should be tapered down (e.g a typical conversion factor for <30 mg morphine would be 2:1, whereas the conversion factor for >1000 mg would be 20:1). ‘Analgesic’ provides a static conversion factor regardless of dose ; this is a flaw that could potentially affect patient safety. Despite these major flaws, I think ‘Analgesic’ could still play a role on the ward. This app is convenient and quick enough to serve as a check to make sure your own calculation is not off by several orders of magnitude. 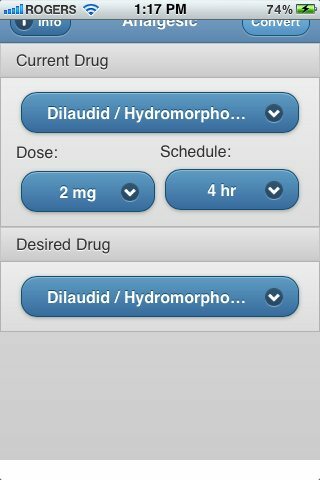 Analgesic iPhone app is a basic opioid conversion app which is convenient however comes with a number of limitations with regard to dosage guidelines. A nice idea for an app; however, there is definitely room for improvement. This is a great review and glad to see this. I am the developer of the application. The good news is that the calculations take place from a database that I manage. This means I’ll be able to take your feedback and update the app instantly. I’m going to try to address these points you identified. Thanks for the review and great info. The use of both mics and mgs on same screen for hydro morphine could lead to confusion. Suggest you select one and stick with it.